What in the world is lilikoi? If you read this blog and you are not a resident of Hawai`i, that’s probably what you’ve been wondering. Lilikoi is the Hawai`ian name for Passion Fruit. It has a very distinctive flavor and not everyone likes it the first time they taste it. I think it’s definitely an acquired taste, although it was love at first bite for me. You can cut it in half, and spoon out the insides with a spoon and eat it, seeds and all. Sometimes I cut up a whole bag of them, scoop out the flesh into a colander and let them drain into a bowl overnight. The juice that results is perfect for making salad dressings, ice cream, jams, or anything else you can think of. A friend gave me an already established purple lilikoi vine along with some of the yellow lilikoi fruits. I planted the purple vine, ate a few of the yellow ones, and kept the seeds from the rest to plant. 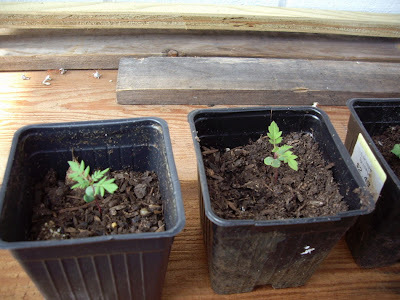 The picture above shows the seedlings. I gave some to a friend in Kailua-Kona (where they have a little real soil) and hers are growing like crazy! 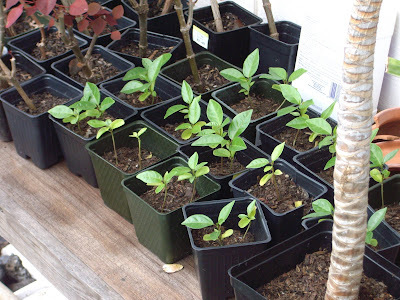 I put these seedlings out, poured soil in around them, but some still are not much larger than they are in the picture above. Some of the others are about 8″ tall. It will be a long time before I get enough lilikoi juice to make ice cream. 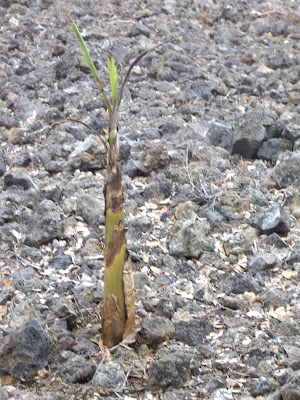 Another of my other early attempts at trying to grow something at 2300′ elevation in lava was this banana. I’m not quite sure it will make it. But you can see a few leaves trying to push through. 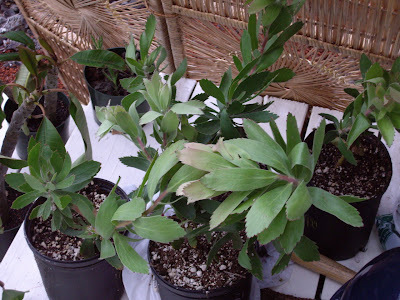 I was given several protea plants. The picture below shows them before I put them in the ground. Unfortunately, the sulfur dioxide got to them and they probably aren’t going to make it. Posted on June 26, 2008 Categories Bananas, GARDENING, Jacaranda, Lilikoi, Plumeria, ProteaTags banana, GARDENING, Jacaranda, Lilikoi, Plumeria, ProteaLeave a comment on What in the world is lilikoi?